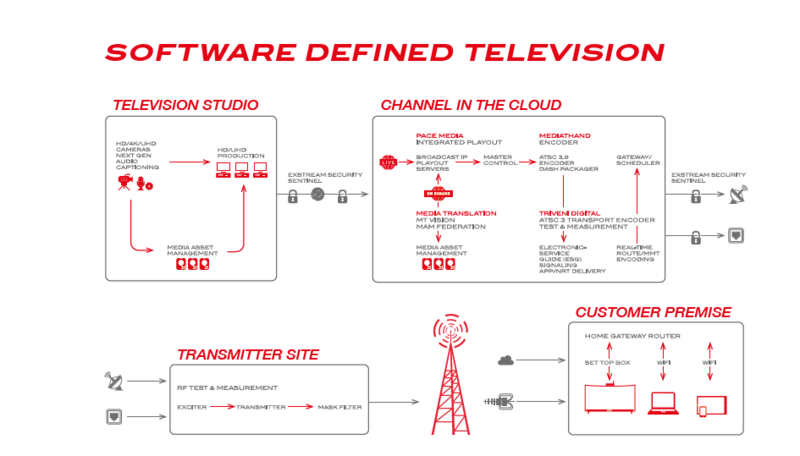 the broadcast and reception of over the air (OTA) television: Software Defined Television. Preparing for the 3.0 world, Thomson Broadcast goes beyond the traditional approach to broadcast content from a television studio and associated network operations centers. By bypassing traditional appliances for each step of the broadcast value chain, namely acquisition, pre/post production, media management and content delivery, Software Defined Television provides you with the same result through virtualization. Our latest IP solution allows the broadcast chain to run on virtual machines and implements commodity IT hardware run from data centers, both public and private. To date, broadcast television has been well differentiated from Over The Top (OTT) streaming delivery on account of higher quality of service, lower latency, multicast delivery, and in general, much higher picture quality. We understand the rigorous needs of broadcasters for newer IP practices and standards to handle broadcast video and have engineered a seamless one-stop solution. The convergence of broadcast and IP has led to broadcasters fully embracing tried and tested IT discipline and treating video as IP encapsulated data. This has resulted in all IP workflows within the broadcast facility and beyond. Broadcast hardened IP switches combined with new SMPTE standards for Video Over IP have resulted in the transformation of hybrid video and file-based workflows into pure IP workflow. Thanks to Thomson Broadcast’s Software Defined Television, servers, storage and networks that serve as the IT backbone of Data Centers are now the video backbone as well. Converged and Hyperconverged infrastructure may now be used to run the entire stack of the video value chain of the broadcaster. Traditional IT and Broadcast Media Production have merged into one. In order to harness the potential and advantages of Software Defined Television, we have incorporated new software disciplines to handle the implementation of video processing that mirrored DevOps in IT. Video processing elements such as encoding, multiplexing, packaging, transcoding, media management, etc. have been re-imagined and implemented as microservices that could run on container and cloud native technologies. Thomson Broadcast’s Software Defined Television solution comprises an all software suite of encoding, packaging, signaling, metadata management, service quality assurance, content distribution, security monitoring, media migration, media asset management, playout automation and master control. This concept is also extended to the customer premise home gateway that runs on standard mobile OS, while implementing the seamless delivery of a suite of Apps for an exceptional consumer experience. We use the power of software defined to deliver content that is personalized and interactive, and in turn, offers new business models and new revenue streams for broadcasters.